The 35 metre motor yacht M’Ocean, listed for sale by Sam Buheiry at ABYS Yachting, has been sold with Onur Eradag at Nautique Yachting introducing the buyer. Built in GRP by Italian yard Arcadia Yachts to a design by Francesco Guida,M’Ocean was delivered in 2012 as the first yacht in the yard’s Arcadia 115 series. The spacious interior can accommodate up to ten guests in five cabins comprising a full-beam master suite on the main deck and four double cabins on the lower deck, all with entertainment centres and en suite bathroom facilities. 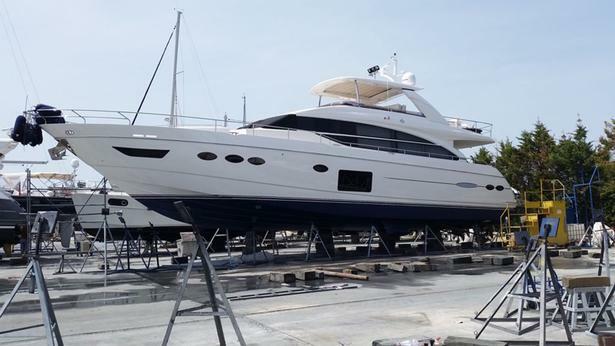 This model is based on the successful Arcadia 85, which has grown to a fleet of five, with Francesco Guida applying the same innovative design to a 35 metre semi-displacement hull built in composite. His design has been guided by an eco-friendly approach which features, for example, a relatively transparent superstructure that allows natural light to fill the interior, and solar panels that provide enough power to limit the use of generators. Interior and exterior furnishings from Poltrona Frau give M’Ocean a clean and uncluttered ambience while twin 1,224hp MAN diesel engines give her a top speed of approximately 16 knots, and a range up to 1,050 nautical miles at 14 knots.